Minimum let period two weeks. Pool 9m x 6m, heating extra. Maid service Available, paid locally. A superb villa for six in the heart of the Riviera, in an exclusive gated domaine close to the famous village of St Paul de Vence with lovely furnishings, heated swimming pool and exceptional gardens enjoying complete privacy and views to Vence and St Jeannet. The pool can be fenced and bedrooms are air conditioned. The approach to the house is through electric gates with drive leading through the gardens to the front door and covered parking area. 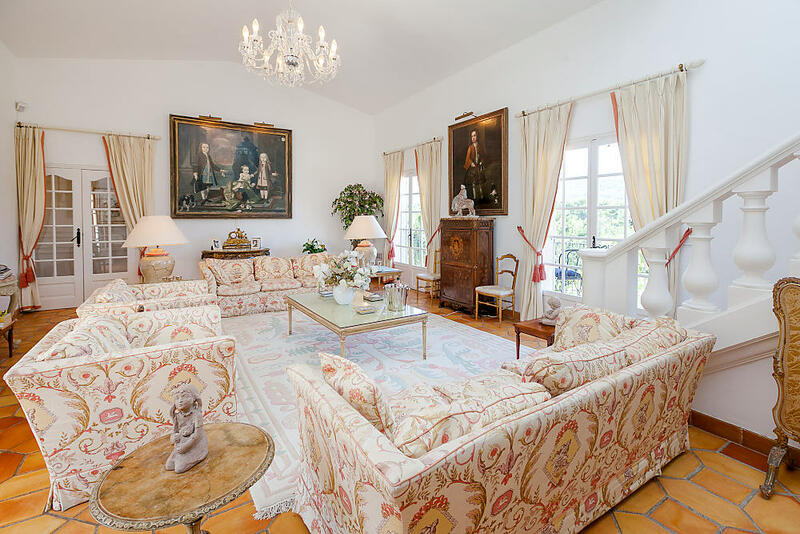 The drawing room is large with Provencal tiled flooring and crystal chandelier, decorated with oil paintings and French furniture. 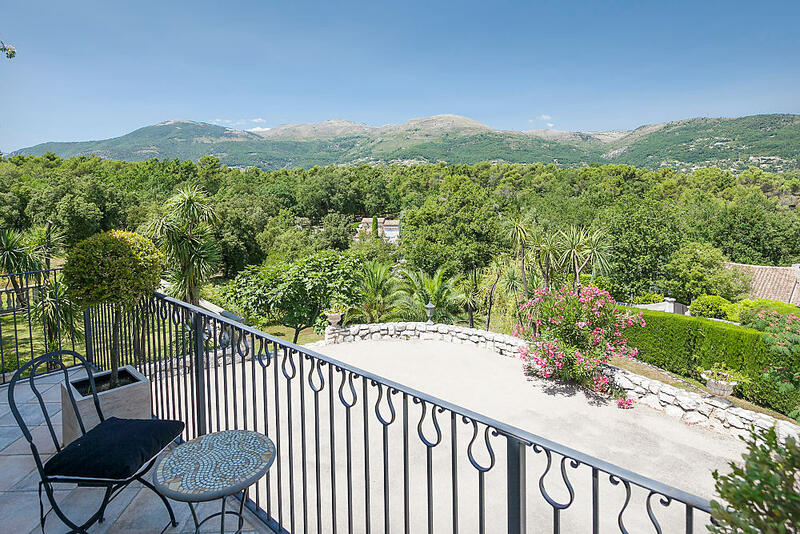 Two sets of French windows lead to a balcony with lovely views as far as the hills of Vence and St Jeannet. 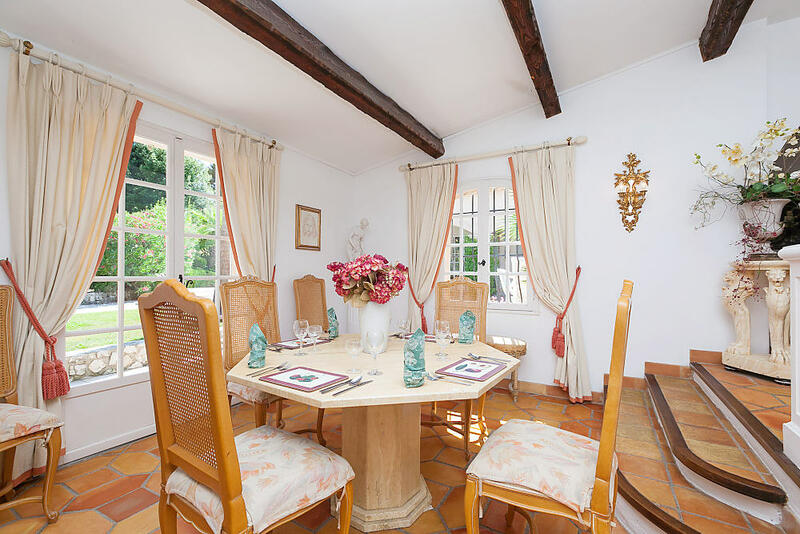 French windows on the other side lead out the dining terrace which overlooks the pool and gardens. There is a fully equipped kitchen and an open plan dining room leading into the gardens. The comfortable second sitting room on the first floor has a large television and a double sofabed to provide additional sleeping accommodation for two more guests if required. 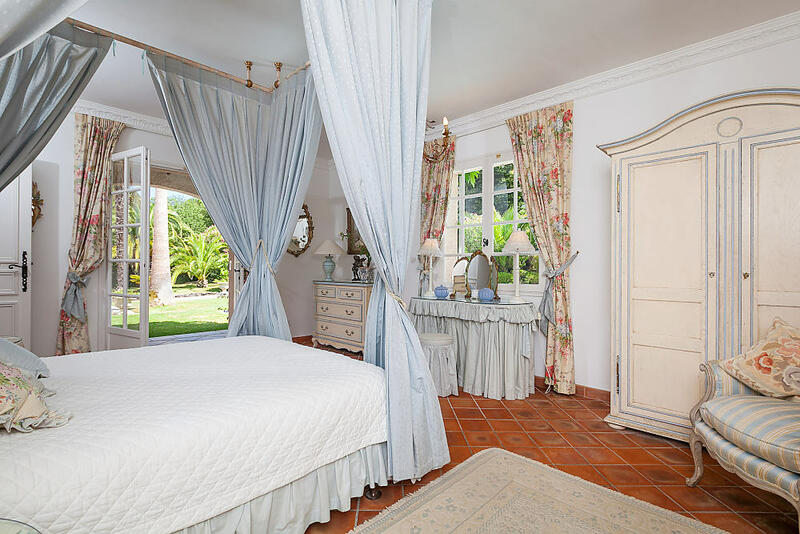 The master bedroom has French windows leading to a shaded terrace and beyond that the garden; there is also an elegant en-suite bathroom. 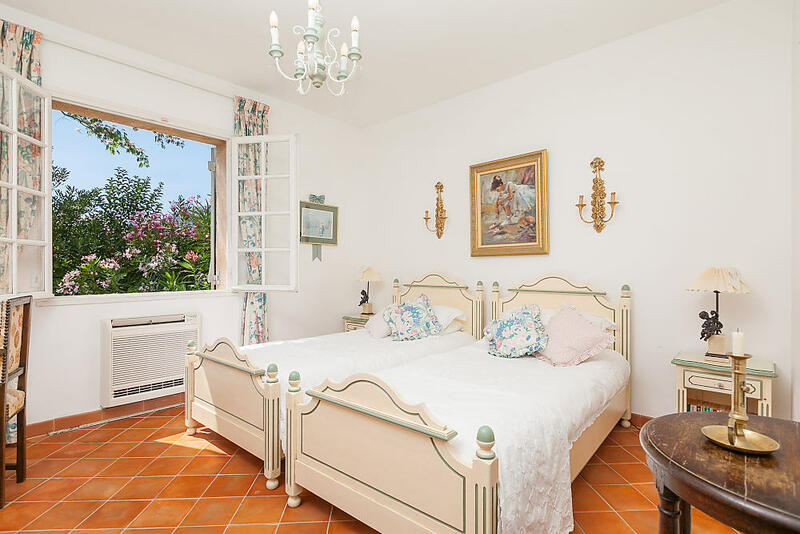 Two further spacious twin bedrooms, one with French windows leading out to the garden and the second has a child’s cot. 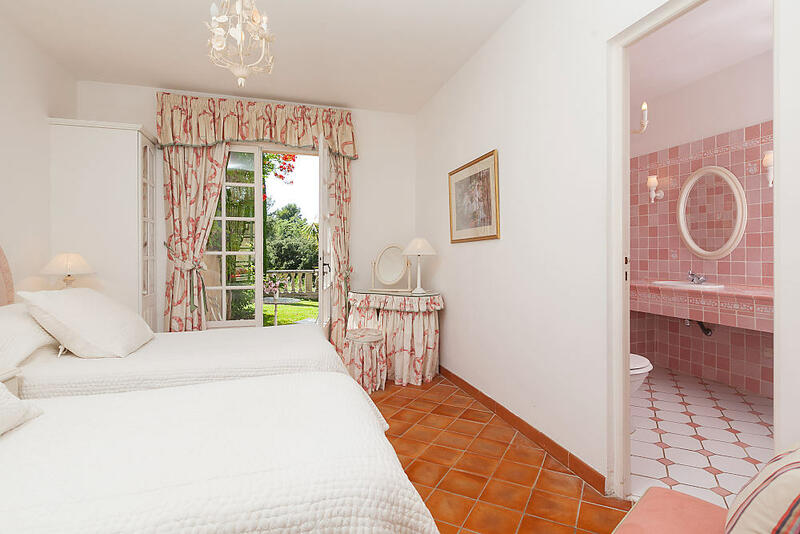 Both bedrooms also have en-suite bathrooms, and all bedrooms are air conditioned. 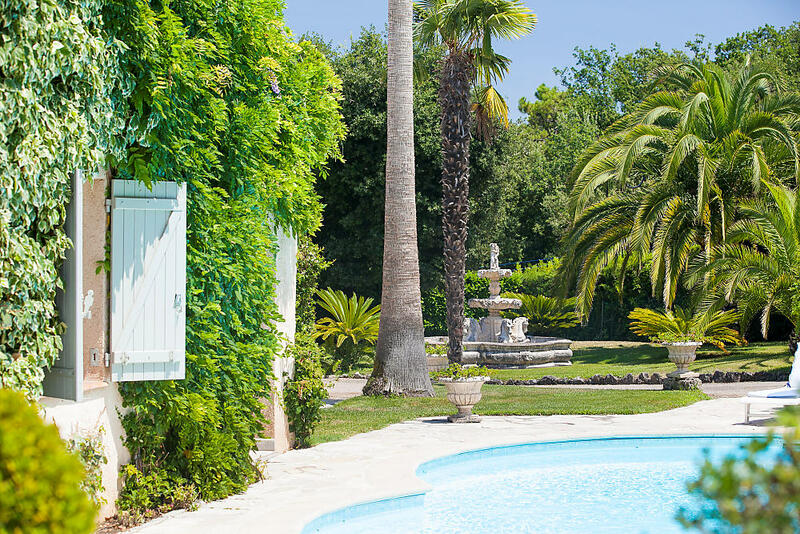 The extensive and beautifully-maintained gardens surrounding the villa provide plenty of space for children to play as well as shaded areas with palm trees and flowering plants. The swimming pool is 9 metres x 6 metres approximately and has a removable fence, pool heating system and underwater lights. A further fully equipped covered dining area has a built in barbeque and fridge with open aspect to the pool and gardens. 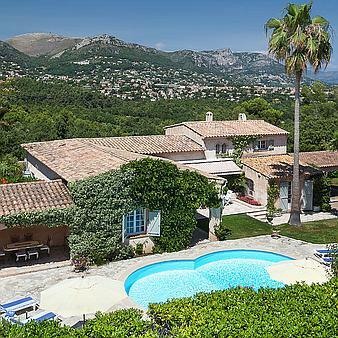 Adjoining the villa is private woodland and there is parking space for up to eight vehicles. 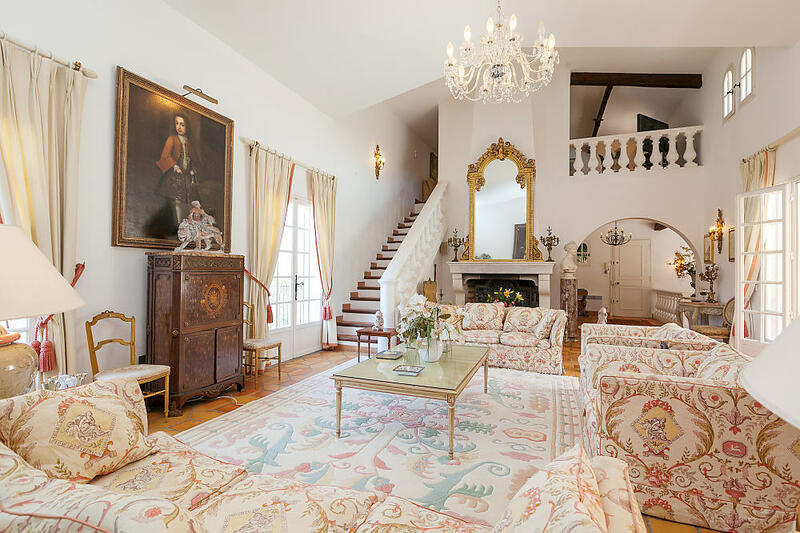 Masquerade is situated some two miles from the picturesque old village of St Paul, where one can relax and enjoy the delights and charm of the art galleries, pavement cafes, boutiques and many good restaurants including the world renowned Le Colombe d’Or. 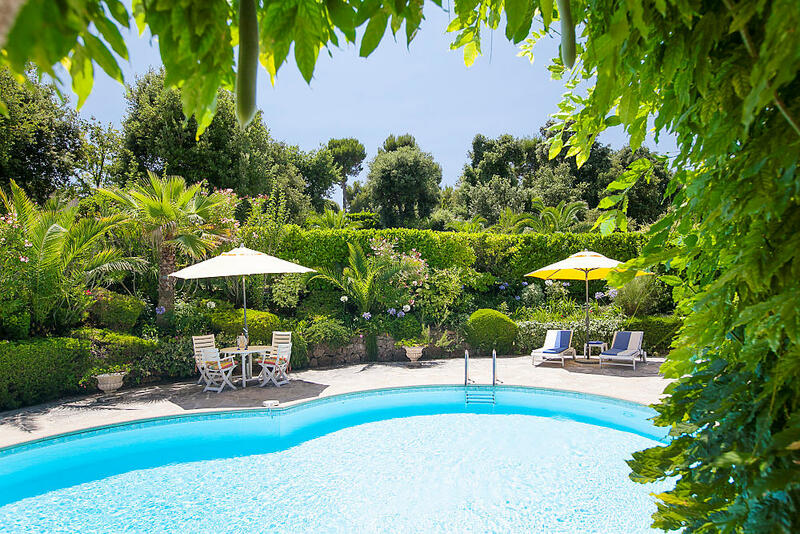 The villa is also conveniently situated just a few miles away from the long beach at Cagnes Sur Mer at the centre of the Baie des Anges, and the famous locations of Cannes, Nice and Monaco. 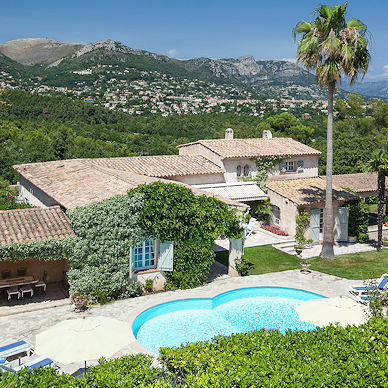 The surrounding area offers almost unlimited activities; sandy beaches, charming medieval town centres, hundreds of restaurants, great museums, art galleries, markets, Shopping destinations, children’s activities, lovely markets, festivals, hiking, golfing, cycling, paragliding, Monte Carlo, Nice, Cannes - to name just a few! 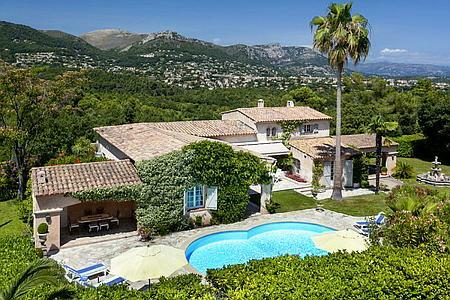 Nice airport is about 10 km, restaurants at St Paul are about 3km and shopping at St Paul or Vence about 4km. Fully equipped Kitchen/ breakfast room, with fridge freezer, separate ice maker, coffee maker, dishwasher, microwave, toaster, oven, hob, washing machine and separate tumble drier. Exclusive location, Large maintained garden, with exotic trees and flowering shrubs, Balcony with picturesque views, bistro table and chairs, open summer dining terrace, and fully equipped covered dining area with built in barbeque and guest WC. Private heated pool 9m x 6m with night illumination (child safety fence if required), Private woodland, and parking for up to 8 vehicles. Final cleaning is extra for one week rentals.